Not all steampunk gadgets are big, bulky things that you carry around. 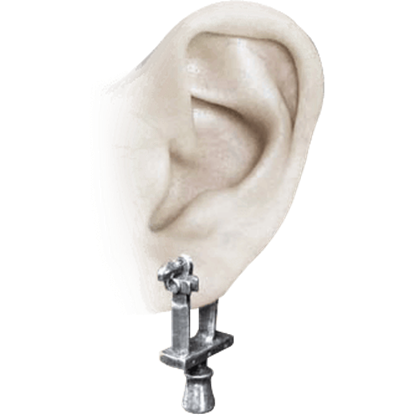 Some are small, designed to be no bigger than your ear, because that is where they go! You will find a few novel little gadgets like that here, as well as countless other impressive and intriguing little adornments in our steampunk earrings section. Just like the wide world of typical style, our steampunk earrings come in a wide assortment of different looks. Combining the elegance and variety of traditional Victorian fashion with steampunk ingenuity offers hundreds, if not thousands of possibilities, and some of those possibilities are displayed here. 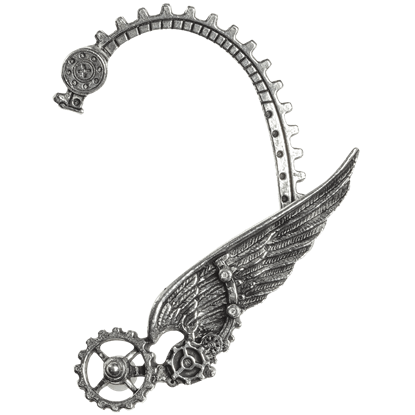 Some of our earrings look like eccentric pieces of steampunk tech, like grand ear trumpets designed to communicate over long distances, while others are purely decorative pieces designed to evoke images of a steampunk world, using bobbles, bits, gears, cogs, sprockets, and other bits of technology. You will find classic Victorian designs, like cameos and keys, touched with steampunk style, as well as wild and outrageous examples of steampunk fashion that feature bronzed gears and cogs accented with beaded arrangements and more. We offer stud-style earrings for the steampunk working woman and dangling, elegant earrings for the regal and elegant steampunk lady of class and distinction. Basically, we have steampunk earrings for any occasion, whether you are dressed up in your steampunk attire or just showing off your steampunk style when you walk the streets in your day-to-day routine. Nothing says Steampunk more than a couple of decorative gears. 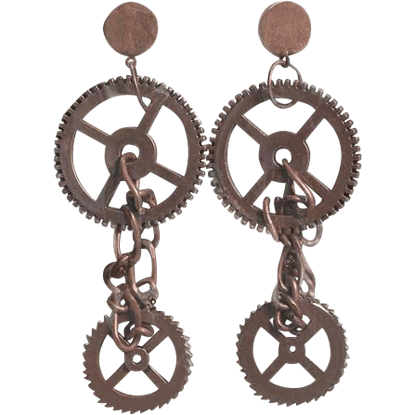 The Bronze Steampunk Gear Earrings will suspend a pair of tooth-edged gears from your ears, creating an industrial look that compliments existing Steampunk styles. This striking jewelry set is a fine example of Victorian style at its greatest. 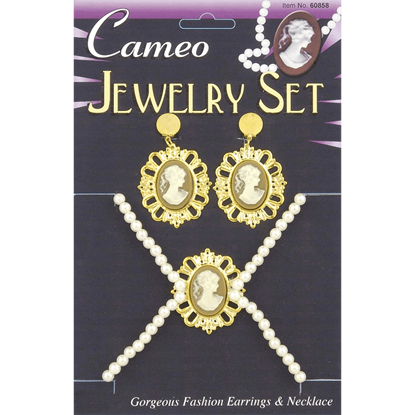 The Cameo Necklace and Earring Set are a trio of beautiful pieces that depict an elegant silhouette of a woman, decorated with rich, golden detailing. 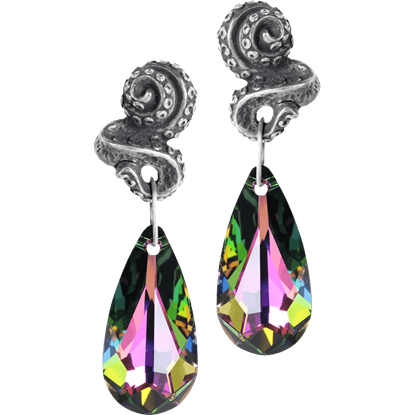 The Clavitraction Earrings are an archetypal reflection of steampunk ethos. Mechanistic cogs of retro industrial progress are repurposed as keys of intricate, clockwork precision, bringing Neo-Victorian ingenuity to any ensemble. The man on the moon can be found in many stories and cultures. It is no surprise that you might find him being upgraded in the world of technical fantasy. 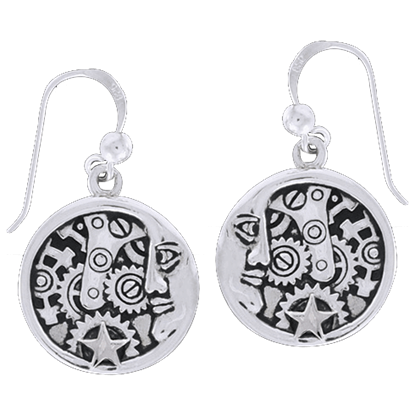 The Clockwork Moon Man Earrings give a new look to this classic character. Henry's powerful 1827 development of this invention will now astonishingly increase brain power and memory retention! The Electromagnet Stud features a surgical steel post. It is sold individually but can fit either ear. Source of the first breath of life from the primitive laboratory of Dr. Frankenstein. 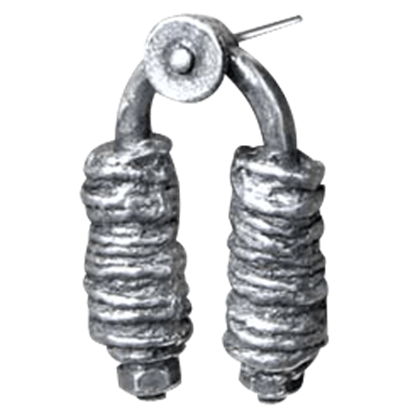 This Igor's Knife-Switch Earring resembles the grand switch often seen on grand gadgets and machines that often activates key mechanisms. Soar to new heights with the Ikarus Ear Wrap. Inspired by the tragic tale from mythology, this Steampunk-themed design will hold strong even on a sunny day. Show the world that you aspire to rise above when you wear this ear wrap. 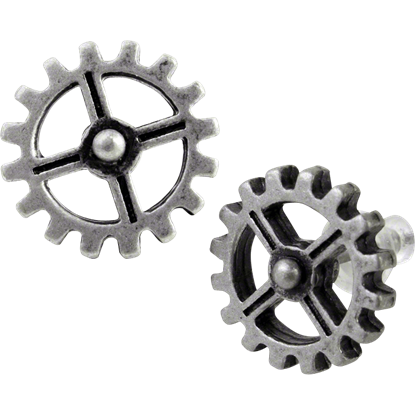 The Industrilobe Stud Earrings depict the quintessential cogwheel, representing the dynamic industrial and intellectual progress of the pre-eminent civilizations. These gears include a center crosspiece surrounded by teeth. 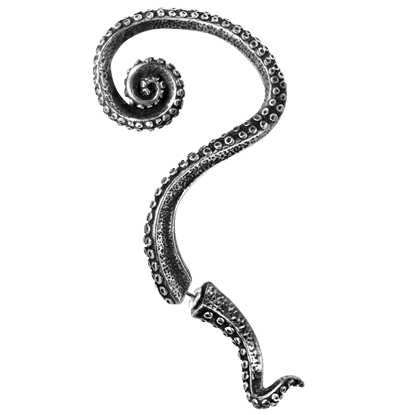 In the deepest trenches of the sea, the kraken lurks, its enormous tentacles waiting to drag anything that passes overhead into the oceans briny depths. What better way to display your own power and depth than with the Kraken Earrings? From the darkest depths of the sea does a tentacle rise to wrap your ear in an overwhelmingly powerful grip...and indeed, this Kraken Single Stud Earring creates a powerful statement that is sure to have an intriguing new effect on your sense of style! The gears of industry press inexorably forward, framing your head with symbols of its operation. 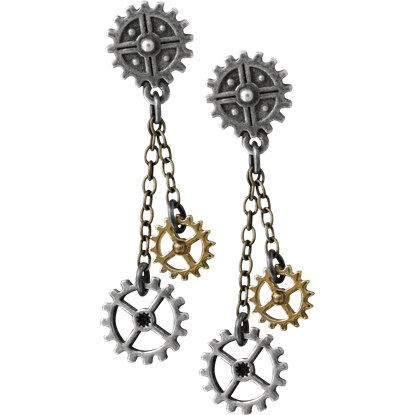 The Machine Head Drop Earrings feature a striking design with cogwheel ear studs that dangle additional cogs on short chains. 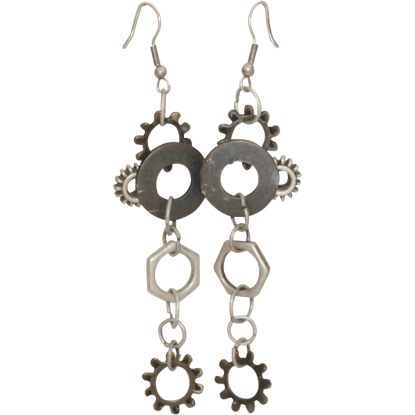 These dangling Steampunk earrings are just the touch of pseudo-industrial style that could benefit a Steampunk costume! 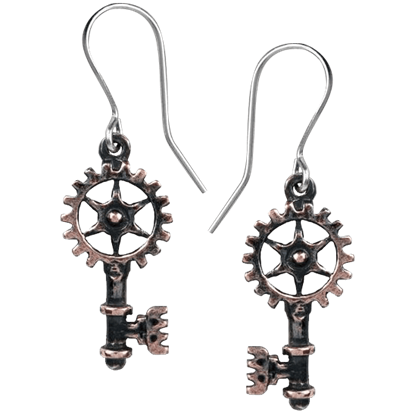 Featuring gears, bolts, and chains, the Silver Steampunk Gear Earrings are machined elegance at its finest.